You probably know that Florence is the city in which the Renaissance was born. You may not be totally familiar with the concept that the style we call Renaissance first became apparent in sculpture, rather than in painting and architecture, which followed soon after. 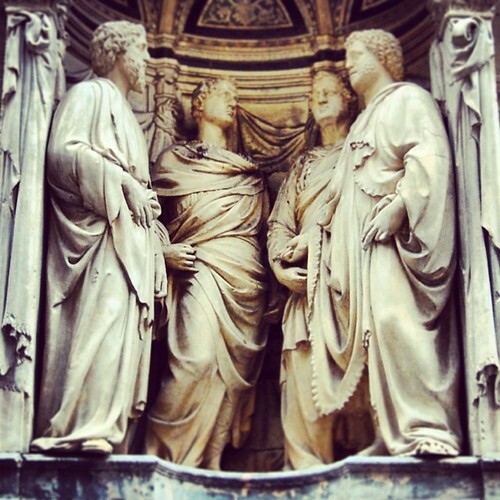 Some of the first sculptural works in the Renaissance style were made for Orsanmichele, a building in the center of Florence that was the city's grain storage building, but that turned into a church because of a revered Madonna housed there. Each of the guilds of Florence were charged to make a sculpture for Orsanmichele's exterior niches, and it's here that we see a kind of face-off between Ghiberti, an older generation artist working in bronze, and the young upstart Donatello, making his first marbles in the first decade of the 1400s. All of the works in the niches now are copies, but they're worth looking at, or you can visit the Orsanmichele museum to see the originals (open only on Mondays from 10am to 5pm - and it's free). What characterizes these early works of Renaissance sculpture is a new naturalness and humanity to the figures represented - for we're almost always talking about standing male figures. Donatello introduces a naturalistic standing pose in which the weight is on one foot and the hip juts out (called contrapposto), and his faces have personalized features and apparent mental depth. Compare this to works by his contemporaries, which tend to be rather decorative and plastic. Other brilliant works of sculpture from the first decades of the Quattrocento can be found in the Museo dell'Opera del Duomo (temporarily partially closed for restoration), since the Operai, the people in charge of the Cathedral works, were the major patron of sculpture in the city for many centuries. Thus you can see the late Medieval reliefs made for the Belltower, as well as later works by Donatello here - like a striking carved wooden figure of Mary Magdalene that Donatello made for the Baptistery. Another obvious location of sculpture in Florence is the Bargello, the national sculpture museum. Donatello has a whole room named after him - and some pieces made for Orsanmichele ended up here too - but you'll also find originals of some works that were displayed in Piazza della Signoria. There are also later Renaissance sculptures, like Michelangelo's drunken Bacchus and Verocchio's David. 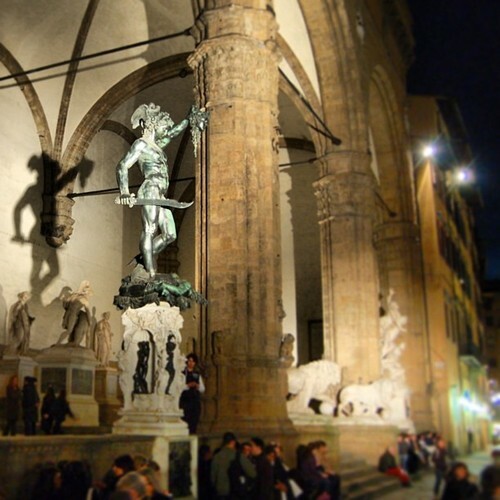 Finally, Piazza della Signoria and the Loggia dei Lanzi are an open air sculpture museum. The Loggia contains Roman as well as Renaissance pieces (see this article for a description of each work in the Loggia dei Lanzi), while the individual sculptures in the Piazza mostly date to the Renaissance, though of course copies have been put in place in most cases for preservation reasons. The great David by Michelangelo was moved to the Accademia in the late 19th century, though Cellini's bronze Perseus and other originals are still found outside.